Last night I was dreading going out as i ripped a hole through a garbage bag and threw it over my head. The torrential rain was on and off followed by huge roars of thunder and lightning illuminating the sky. I know we all kind of have a general idea of what makes up thunder and lightning and causes it to happen but I wanted to just make sure my idea of that was still accurate. According to this article from Planet Science, the whole process starts with just a cloud. The ground below needs to be hot enough to cause vapor to rise up and form the cloud above. While the bottom of the cloud is warm, the top begins to freeze (with a temperature below freezing point) and it becomes icy. This begins the formation of a “thundercloud” in which the particles in the cloud are moving around, bumping into each other and forming a great electrical charge. The particles in the cloud start to separate. The heavy negative charges sink to the bottom of the cloud and the light positive charges stay up at the top. When a positive and negative charge collide, this collision causes lightning. Thunder is caused by this lightning. I found here that thunder is more or less a sound vibration caused by the electricity of lighting. Since the lightning is so very hot, about 6 times hotter than the surface of the sun (Planet Science), it pushes the air separating molecules and creating an even louder sound/vibration. We see lightning before we see thunder because light travels faster than sound. 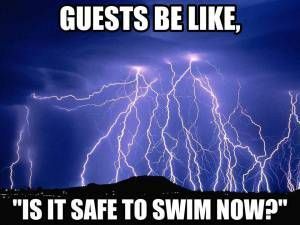 So when you hear thunder after, know that it really happened at the same time as the lightning! It just takes longer to get to us. Old myth tells that counting the number of seconds between seeing the lightning and hearing the thunder can determine how far away the storm is. This has been proven not true (news to me). Apparently, the real way to determine how far away it is is to count the number of seconds between the thunder and lightning and then divide that by five. That number will determine how many miles it is away from you. 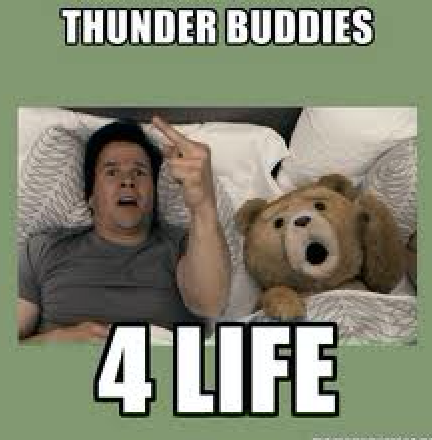 According to the NOAA, it is not possible to have thunder without lightning, they will always occur together. Maybe you’re thinking, “what about heat lightning?”. This is the same as regular lightning but it could just be so far away that you don’t hear the thunder, but it’s there! This link is definitely one to check out. It lists the five ways people can get struck by lighting. I thought the only way to get struck was dead on or if you were near a tree or metal. Turns out even the ground can build up enough electricity to strike you. So, I wasn’t too far off but walking around in that huge storm last night probably was not one of my smartest ideas.. This entry was posted in Uncategorized on October 21, 2016 by Caroline Sorrentino. This was a really interesting article to read. I never really knew how lightning was formed and it is a really fascinating process. I did some more research on lightning and thunder and found this article (http://www.sciencemadesimple.co.uk/curriculum-blogs/primary-blogs/thunder) that goes further in to depth of how the sound of thunder is produced. I’ll be completely honest – I had no idea that thunder CAUSED lightening. I thought that thunder could happen without lightening, and vice versa. I also had no idea that the sound of thunder was actually the sound of lightening! This weather definitely has everyone thinking about thunder and lightening so this is a great read. This was a really well written post and I’m happy it helped educate myself! Right after my practice got cancelled last night due to the storm, our car load drove home trying so hard to differentiate between heat lightening and lightening lightening. I came to the conclusion from the article from Ask Tom Why that its all the same! Apparently, heat lightening is just regular lightening that is too far away. Because it is so far, the thunder accompanying it cannot be heard! Also, it gets its name because of the hot summer nights that were usually considered the best time to go out and watch the storm! I saw your blog and instantly thought about last night’s storm. I was walking back from work and was freaked by the storm, and I had completely forgotten how the process of how lightning works. Your blog explained it nicely and was a good refresher to inform me on how it works. Here is a report on facts about lightning to further develop the subject. That thunderstorm was intense. It’s fascinating to see how you took inspiration from something that happened just last night and dedicated a blog entry to it! Although, I feel a little bit sad that the myth of counting the time between lightning strikes and thunder is a myth; I always thought myself smarter for knowing that. Whoops! It’s also scary to think how dangerous lightning can actually be. Here is an article that delves into what you were talking about with sound waves and light waves (https://www.windows2universe.org/earth/Atmosphere/tstorm/lightning_thunder.html). Interesting post, it was very unique!